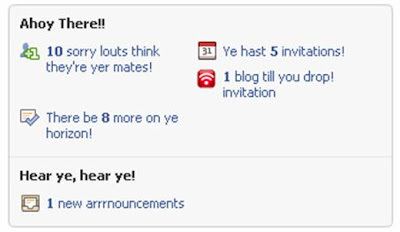 Facebook Pirate language - the new English (Pirate) language setting will liven up your Facebook Profile! Facebook English (Pirate) is the latest language to be added to the platform. Facebook Translation has been progressing across this year as Facebook has been translated into French, Spanish etc. The latest language to be added is Facebook English (Pirate) and it pimps your profile by turning everything into pirate speak! The Pirate English is to celebrate 'international talk like a pirate day' and to enable the Facebook Pirate English feature just go to the bottom of the Facebook home page, go to the language bar and change it from 'English' to 'English (Pirate)'. Interesting example of how the Facebook platform can work in any language and definitely freshens things up / makes Facebook a bit more entertaining. I wonder how many people will now address me in pirate speak today?! UPDATE: Google and Friendfeed have also turned pirate for 'International Talk Like A Pirate Day'! Arrgh! Tanks fer the updates Matey! the pirate-speakin' be lackin in me facebook! Did it get scuttled, or is the problem with me browser? I'm sailing with Apple Safari. Yes seems to have been scuttled and replaced by 'English Upside Down.' 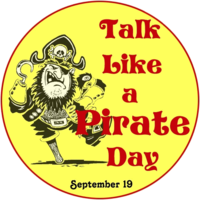 Sure the pirate language will be back soon, not long until International Talk Like A Pirate day 2009! No, I be wrong. Facebook Pirate English is still available as a language option, but only after ye login. I'm pissed off! I had some moron change my settings to pirate crap and now I can't get my ENGLISH back...I don't want this pirate crap!!!!!!!!!!!!!!!! I've had two people enable this on accident and neither of them could figure out how to fix it. This is retarded!!!!! I like it but I want everyone who see my page to see it as I see it....not much fun when its only me who sees the pirate speak. Actually, I'd have to say you'd be pretty mentally deficient if you can't figure out how to change your language settings on FaceBook. arrh pleasin fi me eye. Wud waan fi reciev dem parrot pon mi plank whn di capt develop dem new phrase. Land lubbers haffi spy me plank whn me exchange parrots wit mi shipmates in pirate. I want mine changed back to english and I want it to stay in English. I HATE IT ! AND DIDN'T ASK FOR IT AT ALL....DELETE BUTTON !